The Convention Is in Force – What Next? 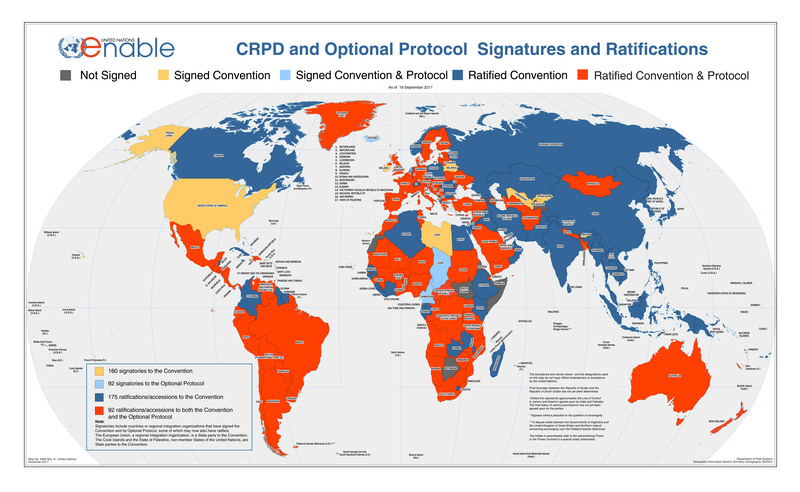 “What the Convention endeavours to do,” said Don MacKay, Chairman of the committee that negotiated the treaty, “is to elaborate in detail the rights of persons with disabilities and set out a code of implementation”. Countries that join in the Convention engage themselves to develop and carry out policies, laws and administrative measures for securing the rights recognized in the Convention and abolish laws, regulations, customs and practices that constitute discrimination (Article 4). As a change of perceptions is essential to improve the situation of persons with disabilities, ratifying countries are to combat stereotypes and prejudices and promote awareness of the capabilities of persons with disabilities (Article 8). Countries are to guarantee that persons with disabilities enjoy their inherent right to life on an equal basis with others (Article 10), ensure the equal rights and advancement of women and girls with disabilities (Article 6) and protect children with disabilities (Article 7). Children with disabilities shall have equal rights, shall not be separated from their parents against their will, except when the authorities determine that this is in the child’s best interests, and in no case shall be separated from their parents on the basis of a disability of either the child or the parents (Article 23). Countries are to recognize that all persons are equal before the law, to prohibit discrimination on the basis of disability and guarantee equal legal protection (Article 5). Countries are to ensure the equal right to own and inherit property, to control financial affairs and to have equal access to bank loans, credit and mortgages (Article 12). They are to ensure access to justice on an equal basis with others (Article 13), and make sure that persons with disabilities enjoy the right to liberty and security and are not deprived of their liberty unlawfully or arbitrarily (Article 14). Countries must protect the physical and mental integrity of persons with disabilities, just as for everyone else (Article 17), guarantee freedom from torture and from cruel, inhuman or degrading treatment or punishment, and prohibit medical or scientific experiments without the consent of the person concerned (Article 15). Laws and administrative measures must guarantee freedom from exploitation, violence and abuse. In case of abuse, States shall promote the recovery, rehabilitation and reintegration of the victim and investigate the abuse (Article 16). Persons with disabilities are not to be subjected to arbitrary or illegal interference with their privacy, family, home, correspondence or communication. The privacy of their personal, health and rehabilitation information is to be protected like that of others (Article 22). On the fundamental issue of accessibility (Article 9), the Convention requires countries to identify and eliminate obstacles and barriers and ensure that persons with disabilities can access their environment, transportation, public facilities and services, and information and communications technologies. Persons with disabilities must be able to live independently, to be included in the community, to choose where and with whom to live and to have access to in-home, residential and community support services (Article 19). Personal mobility and independence are to be fostered by facilitating affordable personal mobility, training in mobility skills and access to mobility aids, devices, assistive technologies and live assistance (Article 20). Countries recognize the right to an adequate standard of living and social protection; this includes public housing, services and assistance for disability-related needs, as well as assistance with disability-related expenses in case of poverty (Article 28). Countries are to promote access to information by providing information intended for the general public in accessible formats and technologies, by facilitating the use of Braille, sign language and other forms of communication and by encouraging the media and Internet providers to make on-line information available in accessible formats (Article 21). Discrimination relating to marriage, family and personal relations shall be eliminated. Persons with disabilities shall have the equal opportunity to experience parenthood, to marry and to found a family, to decide on the number and spacing of children, to have access to reproductive and family planning education and means, and to enjoy equal rights and responsibilities regarding guardianship, wardship, trusteeship and adoption of children (Article 23). States are to ensure equal access to primary and secondary education, vocational training, adult education and lifelong learning. Education is to employ the appropriate materials, techniques and forms of communication. Pupils with support needs are to receive support measures, and pupils who are blind, deaf and deaf-blind are to receive their education in the most appropriate modes of communication from teachers who are fluent in sign language and Braille. Education of persons with disabilities must foster their participation in society, their sense of dignity and self worth and the development of their personality, abilities and creativity (Article 24). Persons with disabilities have the right to the highest attainable standard of health without discrimination on the basis of disability. They are to receive the same range, quality and standard of free or affordable health services as provided other persons, receive those health services needed because of their disabilities, and not to be discriminated against in the provision of health insurance (Article 25). To enable persons with disabilities to attain maximum independence and ability, countries are to provide comprehensive habilitation and rehabilitation services in the areas of health, employment and education (Article 26). Persons with disabilities have equal rights to work and gain a living. Countries are to prohibit discrimination in job-related matters, promote self-employment, entrepreneurship and starting one’s own business, employ persons with disabilities in the public sector, promote their employment in the private sector, and ensure that they are provided with reasonable accommodation at work (Article 27). Countries are to ensure equal participation in political and public life, including the right to vote, to stand for elections and to hold office (Article 29). Countries are to promote participation in cultural life, recreation, leisure and sport by ensuring provision of television programmes, films, theatre and cultural material in accessible formats, by making theatres, museums, cinemas and libraries accessible, and by guaranteeing that persons with disabilities have the opportunity to develop and utilize their creative potential not only for their own benefit, but also for the enrichment of society. Countries are to ensure their participation in mainstream and disability-specific sports (Article 30). Countries are to provide development assistance in efforts by developing countries to put into practice the Convention (Article 32). To ensure implementation and monitoring of the Convention, countries are to designate a focal point in the government and create a national mechanism to promote and monitor implementation (Article 33). A Committee on the Rights of Persons with Disabilities, made up of independent experts, will receive periodic reports from States parties on progress made in implementing the Convention (articles 34 to 39). An 18-article Optional Protocol on Communications allows individuals and groups to petition that Committee once all national recourse procedures have been exhausted.